Help your group become more inclusive, make consensual decisions and implement them, and have more fun. This course could be for you. Co-operative group work helps us deal with our problems, become sustainable and grow, gives us space for creativity, and is inspiring and fulâ€¦filling. Create strong and resilient community and campaign groups. Strong and clear facilitation can help your group work together effectively, get more done and have more fun! This could be for you, if you have skills or information you want to share, and/or you want to support people to learn from each other or share experiences. We ask that you register for this event by returning our flyer, stamped to the address printed on it or copy and paste the form at bottom of article and emailing it to parachutes@riseup.net. There is a max limit on all workshops. Workshops are by Donation, suggested at â‚¬5 for a half day and â‚¬10 for a full day. Beverages and vegan lunch available by donation too. Seeds for Change Network works with grassroots groups involved in Environmental and Social Justice issues to help them organise for action and positive social change. One way we do this is by providing free workshops and training covering all aspects of campaigning work. When developing a workshop or training session we work closely with the group involved to find out in which way we can best provide support. An important area is that of working in groups and community building. We offer workshops on group organisation, decision-making and group dynamics. Conflicts between members, frustration at the lack of success, dwindling numbers, the question of where to go from here are problems every group experiences at some stage. Facilitation and support from outside can often help groups to overcome obstacles. Someone from outside can see things in a fresh way, help to facilitate group decisions and empower the group to get a project going again. If you would like to attend the training you need to register for the event. There are limited places available, particularly the â€˜How To Run A Great Workshopâ€™. This workshop is tailored for people who have a specific idea/intention for a workshop in mind. If you need any more info don’t hesitate to get in touch. Are there areas you or your group needs support with? Which workshops do you wish to attend? 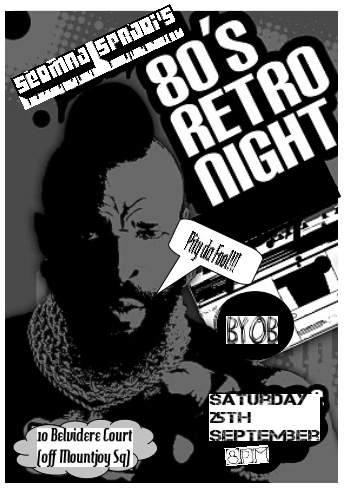 80s night! DJs, danceparty, dress-up madness, come on down for the hyper-cheese craic! Local bands Contort and Bludgeoned, alongside DJs playing punk, metal, and maybe some 80s & hip-hop. Doors at 8, live music at 8.30, DJs till 1am. 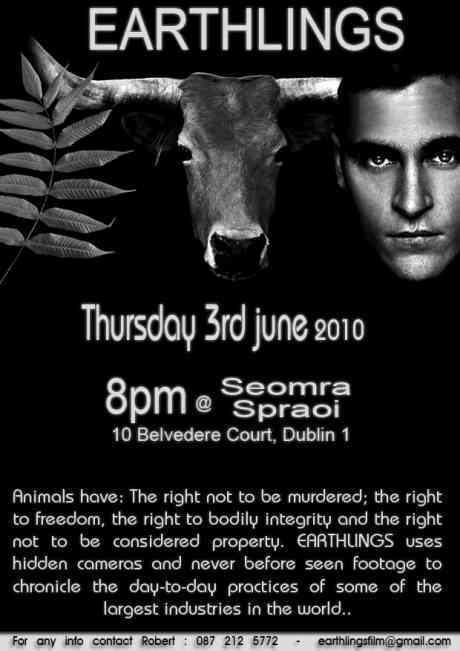 A screening of a short documentary about Climate Camp Ireland 2009 and a collection of other shorts from previous Climate Camps in other countries accompanied by a brief talk about what Irish Climate is and where/what it will be this year. There will also be a chance to ask questions of some of the people involved. The main film is 20 minutes along and the others are between five and twelve minutes. Enjoy some lovely food this Wednesday the sounds of folk outfit The Hanged Man! Food â‚¬5 suggested donation. The Hanged Man are a band of powerful acoustic folk music. Beautiful melody, strong, haunting vocals, all fit to the intimate surroundings. Zine distro with amazing feminist and diy zines from around the world. Talk from an american anarcho-primitivist. American anarcho-primitivist John Zerzan says civilisation is pathological and needs to be dismantled. Zerzan’s critique of civilisation draws on anthropological research to argue that domestication of nature and domestication of humans go hand in hand. 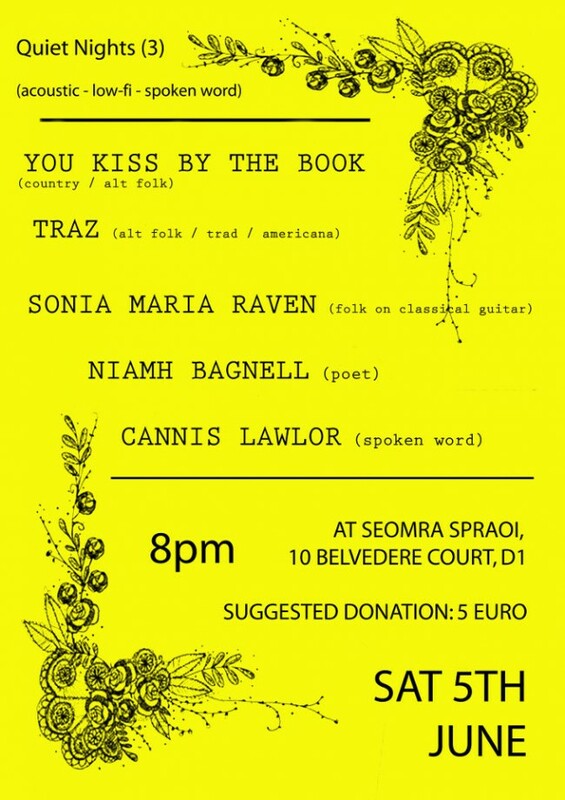 All ages, alcohol-free gig in Seomra Spraoi on a Saturday afternoon (26th June). Arcada, Middle Classs Disaster and Ainriail will be shaking the foundation for the benefit of old and young alike! Arcada are a classy rock band with glorious song arrangements, heavy melody and perfect delivery. Middle Class Disaster are a no-BS 3 piece rock band, raw but with a tasteful melodic edge and tons of energy. Quiet Nights is a monthly acoustic, low-fi, spoken word night in Dublin. A lovely laid back sombre collection of rustic country tinged folk sounds reminscent of the likes of smog or bonnie prince billy at timesâ€¦ a lovely blend of traditional classic country folk and more modern indie folk sounds, complete with some classic slide guitar action. One of those excitingly wide-eyed, wide-eared, discovery moments of loveliness, totally restored my faith in the music coming down the line, not that it was all that lacking to be honest: there are plenty of talented kids about, but to see a group so young and so evolved is heartening. Traz are a group of transition year students from Dublinâ€¦ heavily alt folk inspiredâ€¦ add some stunning choir style voices, a dollop of low sax and a love of the fiddle and you get a very irish take on americana alt folk. A very talented Dublin-based songwriter from Switzerland, sadly still floating below the radar outside of the open-mic scene. A captivating voice over classical guitar, generating a sound that moves between haunting and melancholic. weekly radio show on Liffey Sounds. The talented poet performing a piece titled â€œMusic’s in your soulâ€, exploring music’s ability to break down social barriers. Seomra Spraoi is an autonomous social centre in Dublin city centre. It is run by a non-hierarchical, anti capitalist collective on a not-for-profit basis. It hosts workshops, gigs, political meetings, language lessons, film screenings, a vegan cafe and lots more.